NEW YORK, Oct. 9, 2018 /PRNewswire/ -- The James Beard Foundation today announced the launch of Waste Not, a multi-year campaign designed to encourage culinary professionals and home cooks to reduce food waste by thinking differently about food and adopting full-use cooking methods. The campaign will urge Americans to start with small changes just one day a week — on Waste Not Wednesday. If all Americans eliminated food waste on Waste Not Wednesdays, more than 7.8 million tons of food would be saved each yeari — enough to provide almost 13 billion mealsii to the hungry. "Waste Not reflects the James Beard Foundation's commitment to create a better food world," said Clare Reichenbach, Chief Executive Officer. "Chefs are a leading voice for change. Every day in restaurant kitchens, chefs demonstrate how a full-use perspective on ingredients results in food that is more flavorful, sustainable, and economically responsible. Through both the Waste Not book and Creating a Full-Use Kitchen curriculum, more than 70 chefs are bringing inspiration as well as creative and practical ideas for chefs and home cooks to have an impact on food waste reduction." Waste Not — A new cookbook featuring more than 100 unique recipes by 65 well-known chefs who incorporate commonly discarded ingredients to build layers of flavor. Chefs share their tips and tricks for turning root tops, bones, scraps, seeds, and other ingredients into essential building blocks of good food. Creating a Full-Use Kitchen — A free online curriculum for culinary professionals. Created with founding support from The Rockefeller Foundation, and served up by Morton Salt®, with food waste tracking partner LeanPath, the curriculum is designed to train the next generation of chefs and culinary professionals on techniques and creative approaches to food waste that reduce costs, improve nutrition and enhance sustainability. Culinary Labs — An experiential learning opportunity for culinary professionals from across the country to increase their understanding of food-systems issues — including food waste reduction — sustainable solutions, and practical application. Waste Not Wednesday — A movement to inspire consumers to make simple changes one day a week to reduce food waste. 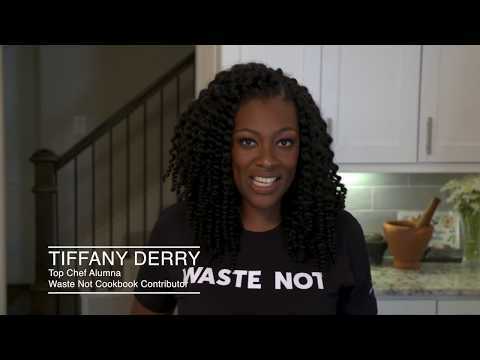 The James Beard Foundation will share tips, recipes, and tools from leading chefs each Wednesday, and has also produced a Public Service Announcement featuring Tiffany Derry, a Top Chef fan favorite and host of Hungry Investors. Taste America — A ten-city tour that celebrates the country's diverse culinary culture and the important role that chefs play in advocating for a more delicious, sustainable, and equitable food world. This year's program will feature unique dining events and in-store cooking demos at Sur La Table (including some of the delicious recipes in Waste Not). In keeping with the Foundation's commitment to reducing food waste, viable leftover food from the events will be donated to those in need in partnership with Feeding America®. Chefs Boot Camp for Policy and Change — The signature program trains chefs to become advocates for eliminating food waste and adopting more sustainable practices. More than 200 chefs have already been trained through the program and another 50 are expected to participate next year. Waste Reduction Practices — Efforts that will reduce food waste by an estimated 30 percent at dining events hosted at the historic James Beard House and around the country. "Even a 15 percent reduction in food waste could save enough food to feed 25 million Americans annually," said chef Tom Colicchio in the forward to the Waste Not cookbook. "Small habits, adopted by many, can tip a culture from indifference and neglect toward a saner, more just future in which we all can share." Use leftover rice to make fried rice on days you don't feel like cooking something new, folding in whatever protein and vegetables you have on hand.